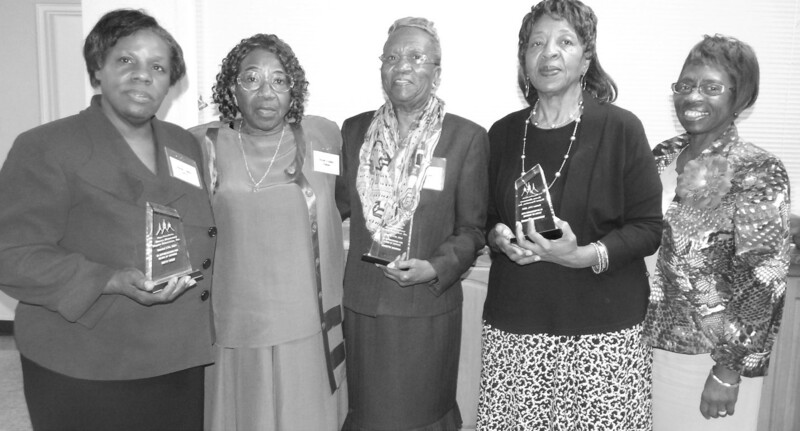 (L to R) Evelyn Green, Mrs. Florrie B. Scriven, Annette M. Warren, Mrs. Thomasina C. White and Carolyn S. Blackshear. The Berean Missionary Baptist Association, Inc., is celebrating a blessed and successful 114th Annual Session under the leadership of Moderator, Rev. Dr. Clarence Williams, Jr. Pastor of the Pilgrim Baptist Church of Savannah and his Leadership Team. The Theme was “Developing Purpose Driven Churches for 21st Century Ministry.” We praise the Lord for the great things He has done and is doing in the life of this Association. This educational and informative Session was held on Thursday, October 16-Saturday, October 18, 2014. The Tremont Missionary Baptist Church, served as the venue for this event. The church is located at 1110 Martin Luther King, Jr. Blvd. Rev. Quentin Morris, Host Pastor. This Annual Session’s Agenda included on Thursday evening, October 16, a wonderful Welcome Program Musical. The Association Musical featured the Music Ministry of the Tremont Temple Baptist Church under the leadership of Mrs. Monina Morris, Directress. The program concluded with an Honors Reception honoring the contributions of Sister Florrie B. Scriven, President of the Women’s Auxiliary, Mrs. Annette M. Warren, Vice President, Women Auxiliary, Rev. Larry J. Stell, First Vice Moderator, Rev. Louis Stell, Statistician, Mrs. Thomasina C. White, Secretary, Women’s Auxiliary, Mrs. Jannie Bowers, Women’s Auxiliary Treasurer and Mrs. Betty West, Dean for their service to the Berean Missionary Baptist Association, Inc. Awards were made to each honoree and were presented by Mrs. Carolyn S. Blackshear, a member of the Association and First Vice President of the Georgia Association of Ministers’ Wives and Ministers’ Widows, Interdenominational. Mrs. Scriven has served for the past 20 years and will also be honored by the Women’s Auxiliary with a Luncheon at the L. S. Stell Banquet Hall at the Bethlehem Baptist Church on Friday, November 21, 2014. She will also be recognized by the Georgia State Senate in Atlanta, GA January 2015 and will be accompanied by Moderator Williams and several family members. On Friday, October 17, The Parent Body Business Sessions, Church Enrichment Seminars, Laymen’s Department and Youth Enrichment Activities were held during the day. Moderator’s Annual Address closed the evening. Saturday, October 18, concluding business sessions and Youth Enrichment Activities were held. The Annual Address of the P resident of the Women’s Auxiliary was also delivered by Mrs. Florrie B. Scriven. New leaders were elected in major positions. The election was held between 10:00a.m – 2:30p.m. The results of the election were announced during the closing business session. Persons elected were: Rev. Richard Hall, 1st Vice Moderator, Rev. C. MeGill Brown, 2nd Vice Moderator, Rev. Joseph Hoze, Treasurer, Sister Evelyn Green, Women’s Auxiliary President, Rev. Barbara Simmons, Women’s Auxiliary, 1st Vice President, Rev. Timothy M. Sheppard, Congress President and Brother James Green, 1st Vice President. These newly elected officers were installed by Rev. Thurmond N. Tillman. Rev. Larry Broxton lead the association in Holy Communion and the benediction was given with Moderator Rev., Clarence Williams signing “God be with you”.